Soft touch custom journals are a perfect giveaway for your next marketing campaign. Promotional neoskin leatherette non-refillable 6" x 8" personalized journal. This Kingston custom imprinted journal has classic style with added functionality. This Junior Executive Custom Tech Journal features a microfiber cloth and a textured elastic closure to hold your smartphone and a pen! Perfect for conferences and executive meetings. This LEEMAN Casablanca Custom Journal Gift Set contains two journals packaged in a high-end 2-piece black gift box. The journals feature covers made of simulated cork giving them a unique texture and look. Soft faux leather cover makes this logo debossed writing journal a perfect corporate gift for any client. Made of simulated cork, the LEEMAN NYC Casablanca Cork Custom Journal features a textured cover with a natural weathered look! Show your appreciation for top employees and clients with this LEEMAN Venezia Custom Journal & Stylus Pen Gift Set! It comes nicely packaged in a 2-piece black gift box. With its many special features, the JournalBook Color Pop Paper Bound Custom Journal would be a welcomed addition to any home or office. It features a flexible paper cover and accented edge that makes this notebook stand out. Perfect for trade shows and seminars! 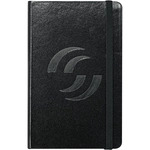 Your company logo will be noticed on this 5" x 7" Soft-Touch Custom Journal Notebook. The soft faux leather cover of this Deluxe Custom Journal features your imprint in full color! Choose from a variety of shapes or create your own! Order today for your next event! Unique and convinient, this Textured Faux Leather Custom Journal w/ Phone Pocket is the perfect gift for college students and employees! The elastic front pocket fits most smartphones. JournalBook Modena Lined Custom Refillable Journal - 8.5" x 10.5"
Perfect for new hires and conferences! This JournalBook Modena Lined Custom Refillable Journal features a textured cover, pen loop, and 100 sheets of white lined paper. What better way to get your company noticed than including your message on this Shinola custom journal and handing out to perspective clients and associates. Enjoy your logo displayed on this custom American-made journal featuring perfect binding that allows your book to lie flat. This medium sized linen hard cover is the ideal size for traveling. This LEEMAN NYC Tuscany Custom Journal w/ Magnetic Closure includes 96 ruled sheets of cream paper. The faux leather features a soft touch and is available in 5 different colors. Add a little fun into any marketing campaign with this JournalBook Spotted Custom Journal Set! This set includes a large journal (5.5"w x 8.5"h), a small journal (3.5"w x 5.5"h) and a square ballpoint pen. This Woodtone Promotional Notebook w/ Pen features 80 sheets of beige ruled paper and a ribbon bookmark. It comes with a color matching ballpoint pen that stored in the spine. Market your logo, company or event on this Shinola custom journal that offers American-made craftsmanship and is sold in retail stores through out the US. Order today! These Moleskine Hardcover Custom Journals are the perfect size to keep in your bag, purse or desk. The bound hard cover makes it perfect for keeping your thoughts organized. Jot down all of your notes in this Traverse Leather Mini Custom Composition Book! Covered in full grain leather, the debossing imprint method will give your logo a unique and high-end look. These custom journals featuring a cardboard cover imprinted with your logo are perfect for any client, employee or business associate. These custom journals offer a professional look that is perfect for any client, employee or business associate. This handsome black genuine leather custom journal has a classic style that any recipient would love to have. This perfect bound Soft Touch Cover Custom Journal has an executive look with a pop of color! It features 80 lined pages, and a pocket on the back cover which is perfect for storing notes and receipts. These attractive, pocket-sized custom JournalBooks use a unique laser engraving process to give your logo a new look. 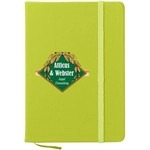 Your full color logo will be noticed on this vibrant colored PVC Custom Journal Notebook. The white stitches that are sewn along the edging of these custom journals offer clean lines and a trendy look. This on-trend LEEMAN NYC Softcover Marble Custom Journal w/ Pen is perfect for gifting to conferences and new hires! It features a 96 page journal and a twist action medium tip pen. For the CEO on the go, ePromos offers promotional bound custom journals. These convenient, portable notebooks are bound in high-quality leather and recycled materials. Bring them to corporate meetings so your employees can take notes in style. Or offer them as a fancy gift to prospective law students or prospective new clients. One thing's for sure: your generosity won't be forgotten with an logo imprinted leather promotional journal. Plus, remember that ePromos has multiple styles for any budget. Get promotional journals imprinted with your name and logo today. Our staff can help any company or organization plan marketing giveaways or events with great promotional products.